Jared Unzipped: The Heavenly Hydrox Cookie. In 1908, a wonderful sandwich cookie debuted to great fan-fare. This cookie featured a layer of sweet creme placed between two crispy chocolate sides. Nope, we're not talking about the Oreo. 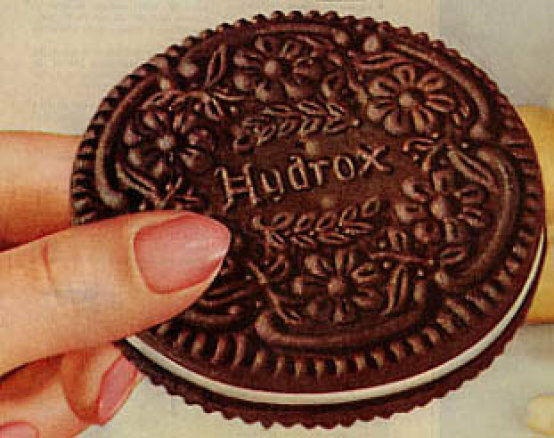 Hydrox was America's first creme-filled chocolate sandwich cookie. 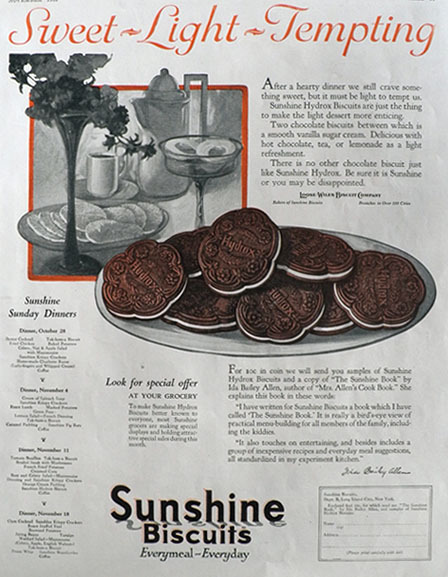 Created by the Sunshine Company, they were sold all across this nation a full four years before the introduction of the Oreo. Obviously, Oreo cookies are heavily inspired by the Hydrox. If you're not paying careful attention, it's easy to mistake one for the other. And yet, the flavor of the Hydrox is where you can tell the difference. Hydrox cookies feature a tangier creme center. Their outer cookies use a dark chocolate mixture, so they're not as sweet as an Oreo. A Hydrox is also crispier, with less of a spongy feel. That way, they last longer when dunked in a glass of milk. 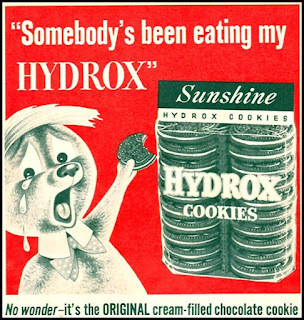 By and large, the Hydrox cookie is a fantastic bit of American pop culture that's largely become forgotten. A 1923 Hydrox ad from Sunshine. As the decades wore on, the Oreo became a massive success with its keen marketing slogans and heavy commercialization. Hydrox drifted further behind in sales, only to be considered a knock-off of the Oreo. Ironically, few realized that the Oreo was in fact the knock-off! By 1996, Sunshine was purchased by Keebler, whom promptly had their elves close up shop on the Hydrox within a few years time. Thankfully, all was not lost. In the time period following Keebler's decision to end production of the Hydrox, they were absorbed by the Kellogg's Company. In 2008, Kellogg's released limited quantities of the Hydrox to celebrate its 100th anniversary. They abandoned the Hydrox trademark after that, leaving many to wonder if the cookies would ever be made again. A Hydrox ad from 1956 featured in Family Circle Magazine. In 2014, Leaf Brands acquired the trademark to Hydrox. They made their intentions well known -- the Hydrox would be produced once again. In September of 2015, the first batches of the Hydrox cookie were made available. Much the David to Oreo's Goliath, the Hydrox stood ready to do battle. Though not nearly as wide-spread in availability, they can be found through many specialty confectionery retailers, as well as be purchased directly on the Amazon Marketplace. You can find them here. And the best part? Unlike the Mexico-made Oreo, the Hydrox is baked right here in the USA! Newly produced Hydrox cookies by Leaf. I can recall eating Hydrox cookies with my grandparents when I was little. If memory serves me correct, I remember enjoying them. Perhaps it's time I ordered a package and brought back some memories. Do yourself a favor and try a Hydrox cookie, too. You'll be glad you did!